We used to be a strictly finish quantum household, we never paid full price for them but they still worked out quite expensive per cycle! For years I ribbed my Mum & Dad for shopping in Aldi, I have to confess I was a complete snob and thought that everything was cheap and nasty... Until a store opened in our local town. How could I refuse to have a look at the bargains advertised on the TV and in newspapers, that was a couple of years ago and now I'm a total convert. I admit, we couldn't do a complete shop there every week, there are some things they just don't stock and the vegetarian range is quite poor, I can only stand eating nut cutlets and veggie burgers once in a while!!! But on the whole I'm really impressed with the quality of their own brand goods and the price of their branded items. 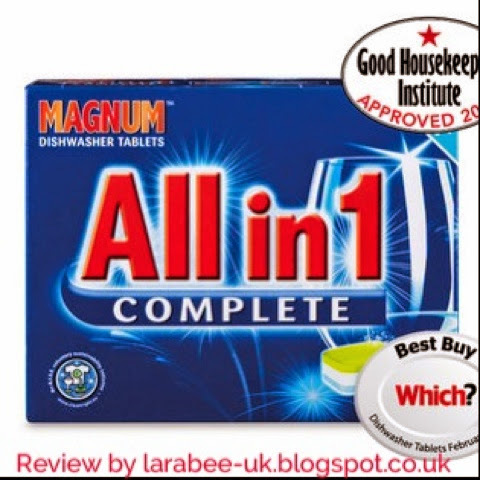 When I was recently in there, on a complete whim I purchased some magnum Allin1 complete dishwasher tablets, these were £3.99 for 40 10p each - amazing! Now, consider that we've been using finish quantum for years and quite honestly have been disappointed in the results of those, I don't know why on earth I tried these, but I did and do you know what? 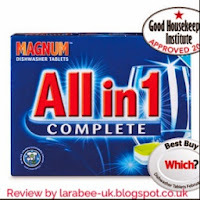 They are fantastic, there really is no other word for them, I'm not even going to say 'for the price...' They just are excellent and clean just as well as the more expensive ones in our opinion, The Hubs agrees 100% with me on this one! If you are looking to save a few pounds, do give these a go and see how you get on. We have not been paid for this review, all opinions are our own, when we find something we like, we like to share!